Here is a list of some of the international press and media coverage of the PHL's research activities, contributions, or mentions. The links are sorted by categories and dates associated to a press release or a particular project. Astronomers have solved the mystery of 'strange signals' that appeared to come from a star 11 light-years away (July 21, 2017). Business Insider [web link]. 'Mystery' signal from space is solved. It's not aliens (July 21, 2017). PhysOrg [web link]. Ross 128: scientists solve mystery of radio signals coming from nearby star (July 21, 2017). Newsweek [web link]. Vida extraterrestre: descubren señales misteriosas provenientes de una constelación cercana a la Tierra (July 21, 2017). ARG Noticias [web link]. ‘Weird!’ Signal from Ross 128 isn’t from Extraterrestrial Intelligence, Astronomers Say (July 23, 2017). Sci-News.com [web link]. Weird signals from nearby star probably weren't from there (July 21, 2017). CNET [web link]. Red Dots Campaign Hunts Planets at Nearby Barnard's Star (July 19, 2017). Space.com [web link]. Arecibo observatory joins Red Dots today for simultaneous observations of Barnard’s star (July 16, 2017). Reddots Space [web link]. Strange radio signals detected from a nearby star (July 18, 2017). Universe Today [web link]. Las "misteriosas señales" que astrónomos de Puerto Rico captaron provenientes de Ross 128, una estrella cercana a la Tierra (July 19, 2017). BBC [web link]. Arecibo recibe extrañas señales desde la enana roja Ross 128 (July 14, 2017). Europapress.es [web link]. The Strange Radio Signals Coming From a Nearby Star (July 17, 2017). The Atlantic [web link]. Detected Strange Signals Coming From a Star 11 Light Years Away (July 18, 2017). Aerospace Engineering [web link]. There Might be More Planets in the Habitable Zone (February 24, 2017). Astrobiology Nasa [web link]. Many More Planets Could Support Life Than Previously Thought (February 23, 2017). Inverse [web link]. Científicos boricuas descubren que hay más planetas habitables (Feb 24, 2017). El Nuevo Día [web link]. 150-Year Journey to Alpha Centauri Proposed (February 4, 2017). Scientific American [web link]. ‘Photogravitational Assists’ to Proxima b (February 1, 2017). Centauri Dreams [web link]. A novel concept for braking breakthrough starshot (July 26, 2017). Universe Today [web link]. Where should we look for alien life? (August 24, 2016). BBC [web link]. Red stars that are nothing like the sun may be our best hope of finding aliens (August 24, 2016). Business Insider [web link]. Planet Found in Habitable Zone Around Nearest Star (August 24, 2016). ESO [web link]. Y’all Need to Chill About Proxima Centauri b (August 26, 2016). Wired [web link]. ESOcast 87: Planet found around closest Star (August 24, 2016). ESO [web link]. The exoplanet next door (August 24, 2016). Nature Video [web link]. Proxima Centauri, closest star to the Sun, hosts a planet in the habitable zone (August 24, 2016). Physics Today [web link]. This Planet Just Outside Our Solar System Is 'Potentially Habitable' (August 24, 2016). NPR [web link]. Planeta parecido a la Tierra es vecino nuestro (August 25, 2016). El Nuevo Día [web link]. Planeta en zona habitable orbita la estrella más cercana a nosotros (August 24, 2016). Primera Hora [web link]. Científicos de la UPR en Arecibo colaboran en descubrimiento de nuevo planeta (August 24, 2016). Diálogo UPR [web link]. Descubren planeta que podría ser habitable cerca de la Tierra (August 24, 2016). Metro [web link]. Detectan el exoplaneta más cercano y similar a la Tierra hasta ahora (August 24, 2016). Tendencias [web link]. Otros planetas que pueden ser habitables no muy lejanos (August 24, 2016). ABC Ciencia [web link]. Descubren el mundo potencialmente habitable más cercano a la Tierra (August 24, 2016). Hypertextual [web link]. La cédula de habitabilidad (August 24, 2016). La vanguardia [web link]. We're obsessed with this visualization of all the 'Goldilocks' planets (December 18, 2015). Tech Insider [web link]. Find Alien Planets That Could Support Life With This Amazing Chart (December 17, 2015). PopSci [web link]. Nearly 2,000 Planets That Could Hold Water, Visualized (December 17, 2015). Motherboard [web link]. 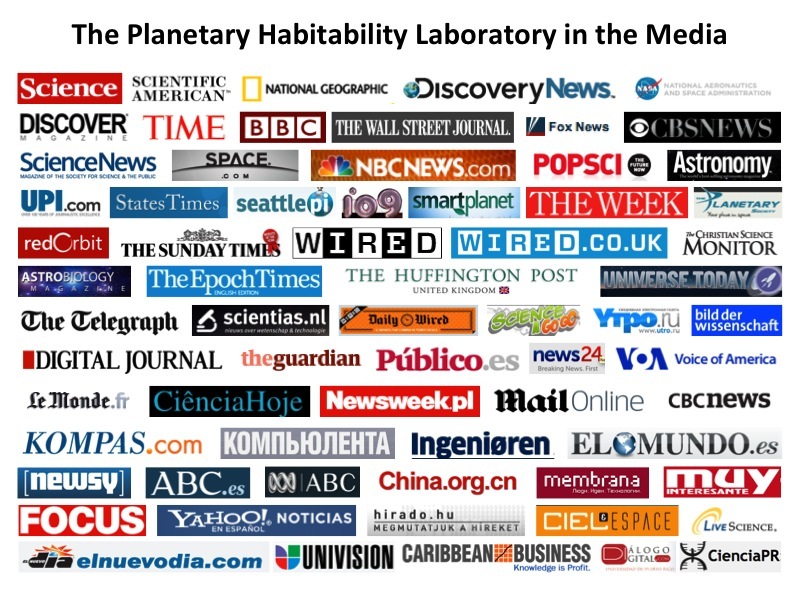 Avance para identificar planetas potencialmente habitables (September 25, 2015). El Nuevo Día [web link]. Rice lands grant to explore exoplanet magnetic fields (September 14, 2015). Rice University [web link]. Nearby Alien Planet May Be Capable of Supporting Life (June 25, 2014). Space.com [web link]. Huffington Post [web link] NBC News [web link]. This Potentially Habitable Super-Earth Is Just 16 Light Years Away (June 25, 2014). io9 [web link]. Is this the most Earth-like planet ever found? (June 25, 2014) Daily Mail [web link]. Newly-discovered alien world tops the list of closest, most Earth-like exoplanets (June 25, 2014). TWN [web link]. Higher scorer on the easy scale: Gliese 832c and potential habitability (June 39, 2014). Astrobiology Magazine [web link]. Found! Oldest Known Alien Planet That Might Support Life (June 3, 2014). Space.com [web link]. Huffington Post [web link]. FOX News [web link]. Super Earths Found Circling Ancient Star (June 3, 2014). National Geographic [web link]. Found! The Oldest Known Alien Planet That Could Support Life (June 4, 2014). Business Insider [web link]. Kapteyn b and c: Two Exoplanets Found Orbiting Kapteyn’s Star (June 3, 2014). Sci-News.com [web link]. Would Life Be More Advanced on a World Twice as Old as Earth? (June 9, 2014). Air & Space magazine [web link]. 100 Million Planets in our Galaxy May Harbor Complex Life (May 29, 2014). Air & Space magazine [web link]. The Milky Way may host over 100 million planets supporting complex life (June 10, 2014). GizMag [web link]. (June 10, 2014). SEN [web link]. Scientists: 100 million worlds may have complex alien life in our galaxy (June 9, 2014). SPLOID [web link]. Milky Way Could Have 100 Million Planets Hospitable for Complex Life (June 5, 2014). Popular Mechanics [web link]. Milky Way may bear 100 million life-giving planets (June 5, 2014). PhysOrg [web link]. Our galaxy may hold 100M complex-life-supporting planets (May 30, 2014). WSU News [web link]. 100 Million Planets Could Harbor Complex Life in the Milky Way (June 10, 2014). DailyGalaxy [web link]. Milky Way may bear 100 million life-giving planets (June 3, 2014). Cornell Chronicle [web link]. A review of data gathered by planet hunters hints there may be 100 million habitable worlds in the Milky Way (June 10, 2014). News.com.au [web link]. 100 millones de planetas pudieran sustentar vida (May 30, 2014). El Nuevo Día [web link]. Voie lactée : 100 millions de planètes pourraient abriter la vie (June 10, 2014). Journal de la Science [web link]. 100 millions de planètes de la Galaxie compatibles avec une vie complexe (June 8, 2014). Futura Sciences [web link]. Kepler's cool find: Another Earth-size planet (April 17, 2014). USA Today [web link]. Earth-Size Planet Where Water Could Exist Discovered (April 17, 2014). The Wall Street Journal [web link]. Goldilocks worlds: just right for life? (April 17, 2014). National Geographic [web link]. How a sunset might look on Earth's new cousin Kepler-186f (April 17, 2014). CNET [web link]. Zo zou een zonsondergang er uitzien op de kersverse neef van de aarde (April 18, 2014). DMorgen [web link]. Tour the distant planets most likely (so far) to support life (May 9, 2014). CNET [web link]. Habitable planets common around red dwarf stars (March 5, 2014). SEN [web link]. Les exoplanètes potentiellement habitables (March 4, 2014). Sciences et Avenir [web link]. Taking a Closer Look at Mysterious Pluto (November 15, 2013). Discovery News [web link]. Image of the Day: A map of Pluto (November 15, 2013). DVICE [web link]. Say hello to the slightly less blurry Pluto (November 15, 2013). VR-Zone [web link]. The surface of Pluto like you've never seen it before (November 14, 2013). io9 [web link]. Epic Space Photos of the Week (Nov 9-15) (November 15, 2013). Discovery News [web link]. Exoplanet tally soars above 1,000 (October 22, 2013). BBC News [web link]. Number of confirmed exoplanets soars past milestone (October 22, 2013). National Geographic [web link]. Alien Planet Count Passes 1,000 Worlds, a Milestone (October 23, 2013). Space.com [web link]. NBC News [web link]. HAD IT with Planet Earth? There are 12 alien worlds left to try out (October 23, 2013). The Register [web link]. There Are Now Officially Over 1,000 Confirmed Exoplanets! (October 23, 2013). Universe Today [web link]. More Than 1,000 Exoplanets Have Been Discovered Since 1992 (October 23, 2013). RedOrbit [web link]. Exoplanets: 1,000 and Counting (October 25, 2013). Astrobiology Magazine [web link]. One thousand exoplanets but still no twin for Earth (October 17, 2013). The Guardian [web link]. On the Road to One Thousand Exoplanets (October 16, 2013). Universe Today [web link]. Exoplanets and the Search for Life in the Universe (October 11, 2013). Universe Today [web link]. Number of Confirmed Alien Planets Nears 1,000 (September 26, 2013). Space.com [web link]. Yahoo News [web link]. FOX News [web link]. Huffington Post [web link]. UPR: Exoplanet list soars above 1,000 (October 22, 2013). Caribbean Business [web link]. Superan los 1,000 los planetas extrasolares descubiertos (October 23, 2013). El Nuevo Día [web link]. Exoplanetas descubiertos superan los mil y 50% fueron hallados desde Chile (October 22, 2013). La Tercera [web link]. 1000 nouveaux mondes (October 23, 2013). Le Munde [web link]. The Top 12 Habitable Exoplanets (September 10, 2013). Air & Space Smithsonian [web link]. Three Potentially Habitable Planets Found Orbiting Gliese 667C (June 25, 2013). Universe Today [web link]. Scientists Discover Nearby Star Is Harboring Not 1 or 2 but 3 'Super Earths' That Could Support Life (June 25, 2013). The Atlantic [web link]. Confirmed: A Star System with Three Potentially Habitable Planets! (June 25, 2013). io9 [web link]. Nearby star breaks the bank with three planets that could have alien life (June 26, 2013). Yahoo! News Canada [web link]. Researchers: Newly found planets might support life (June 26, 2013). CNN [web link]. Detectan 3 planetas habitables cerca de nuestro sistema solar (June 26, 2013). El Nuevo Día [web link]. 3 new planets could host life (April 21, 2013). CNN [web link]. The 10 Best Replacements For Earth (April 21, 2013). Business Insider [web link]. Habitable Worlds? New Kepler Planetary Systems in Images (April 18, 2013). Universe Today [web link]. Most Earthlike planets yet seen bring Kepler closer to its holy grail (April 18, 2013). Science News [web link]. Space telescope discovers the most Earthlike exoplanet yet found (April 18, 2013). UPI [web link]. Super-Earth planets snug ‘in the zone’ (April 22, 2013). Futurity [web link]. How astronomers find real (and fictional) planets around other stars (April 1st, 2013) Yahoo! News, Canada [web link]. Gl 581: The Case for Habitable Planets (August 2, 2012). Centauri Dreams. [web link]. Nyt katalog over universets beboelige planeter (Dec 8, 2011). Ingenioren [web link]. Астрономы представили рейтинги обитаемости планет и лун (Nov 24, 2011). Membrana. [web link]. Waiting for a Signal From Arecibo (September 21, 2017). The Atlantic [web link]. Puerto Rico’s Arecibo Observatory Survives Hurricane Maria, But Will Receive Less Funding From NSF (November 18, 2017). Inquisitr.com [web link]. This Exoplanet Periodic Table Neatly Classifies More Than 3,700 Distant Worlds (November 18, 2017). Science Alert [web link]. FAQ: The science of Aven Prime (June 15, 2017). Steam Community [web link]. Sand worms and lightning: Aven Colony takes city-building to exoplanets (June 22, 2017). Arstechnican.com [web link]. Aven Colony Credits (June 2017). Moby Games [web link]. Científico boricua estudia la posibilidad de vida fuera de la Tierra (February 21, 2017). El Nuevo Día [web link]. Ranking Exoplananet Habitability (March 23, 2016) Many Worlds. [web link]. Goldilocks Worlds: Just Right for Life? (April 17, 2014) National Geographics. [web link] [print, July 2014].